@MaineSkiFamily went to Sugarloaf Maine today to ski some POWDER with some friends from the Freeport ski teams. Good call as Saddleback was on wind-hold all day. 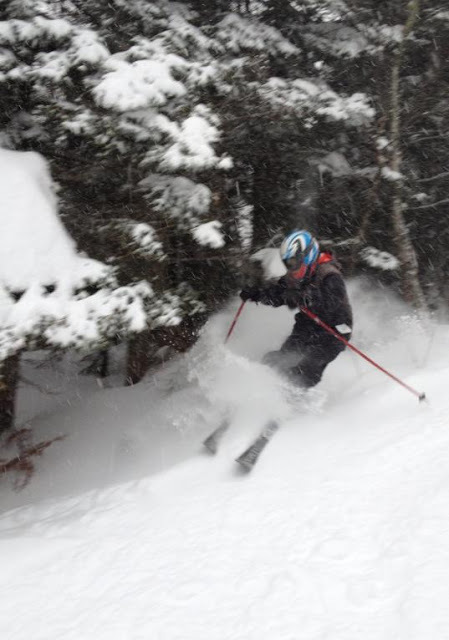 We find that Sugarloaf tends to turn lifts better during a Northeast gale than Saddleback does. Anyway it was a great day. It snowed very heavy all day. Most of the upper lifts were on wind hold. The T-Bar was open but we didn't venture over there. The Superquad lift was a zoo most of the day so we stuck to the Bucksaw and West Mountain chairs for most of the morning. We made a few powder turns off the Whiffletree chair in the afternoon. It was windy, but the snow piled up all day and we had 10 inches on the ground by quitting time. Glancer off the Bucksaw trail was a blast. Poleline and Buckboard off the Whiffletree chair skied extremely well. All the trails had major powder stashes everywhere. Nice soft turns all day. Tomorrow should be killer and both Saddleback and Sugarloaf. We have other commitments so we won't be skiing but if you can get up there you should. Should be great! It was a tough day for pictures due to the NUKING SNOW getting my IPhone all wet but here is a short video off Buckboard. Apologies for holding the IPhone in the wrong direction.